In the summer of 1976 I was spending the weekend with my grandparents. I was ransacking my Pappaw’s dresser drawers and digging through his hunting coats looking for ammunition for the 22 rifle. My Pawppaw hollered, “look in that old shoebox in the top drawer.” Sure enough I found several rounds of ammunition in the shoebox but I also found a heavy spool of silver wire. I had never seen anything like it and I could tell from the information on the outside of the spool that this was some kind of recording device. I have always loved history and old things and I was in old stuff heaven at my grandparents’ house. My grandparents never threw anything away and in their home you might open any drawer or a closet and find something that had not been used or even touched for years. At different times each of my grandparents gave me old keepsakes. I suspect they gave them to me because they knew I would take care of them, and I have. One of these treasures was this spool of silver wire. When I found the wire I carried it out to the living room. My Pappaw said, “let me see that” and I handed him the spool. He inspected the spool closely and said, “Kenneth Lloyd,” (My Saline County family all call me by my first and middle name) “that is a recording of your Dad and the Warford Band makin music on the radio a long time ago.” He said, “if you can find a silver wire recorder I bet it would still play. I will give you that if you promise you will take care of it and try to find a recorder to play it on.” I of course gave my word and took the spool of silver wire. My Pappaw passed away a few months later in April 1977. Years later when the internet came into existence I began to periodically search for information about silver wire recordings and to try to locate a silver wire player that worked so I could hear what was on the wire. I doubted there would be anything on it after so many years but I could not give up. I had to try to hear what was on that wire. Every few years I would dig it out and search the internet again until finally in 2004, I located a man in Lansing, Michigan who rebuilt silver wire recorders. I contacted Steve Gwost and he agreed to try to play the silver wire on one of his recorders and if something was on it he would make me a digital audio file. Putting that spool of silver wire into the mail and sending it off to a total stranger was one of the hardest things I’ve ever done. The one thing I knew was that Steve Gwost was a kindred spirit a lover of all things old and historic. I hoped I could trust him to take care of it and get back to me. It was worth the risk to see if something might still be on that wire. A few weeks later I received a package from Steve and true to his word not only did I get my spool of wire back but I also got a CD. I ran to the computer like a kid on Christmas morning, and there it was – the Warford Band on KBBA. The quality of the recording leaves a lot to be desired for sure but the content of the recording is priceless. It just sounded like noise at first but the longer you listen to it the better it sounds. It is like your brain figures out how to filter out all the static. The attached audio clip is of the Warford Band playing live on the radio in about 1953. The station was KBBA Benton Arkansas. The station is still on the air but it is now called KEWI. You can read an interesting history of the station on Saline 24/7. HISTORY OF BENTON RADIO The history was written by Preston Bridges the station’s first Chief Engineer. The Station went on the air in April 1953. KBBA was an AM radio station that broadcast at 690 kilocycles from their 280’ tower in Benton Arkansas. KBBA broadcast in half hour or hour segments. Many artists played live shows on KBBA and a few went on to fame and fortune. The most famous was probably Charlie Rich who is best known for his recording Behind Closed Doors. The Browns also played on KBBA and later played and became part of the Grand Ole Opry. The Warford Band would never make the big time but they were radio pioneers and had one of the first weekly shows on KBBA. We do not know the exact date of the recordings on the silver wire but we know they were made between April 1953 and October 1953. We know this because before Chuck Warford sings on the recording, Floyd Warford, asks his age and he was 11. The Warford Band’s show was sponsored by L.C. Parsons and Elmer Lewis – Parsons and Lewis Grocery and Service Station, located on the Malvern Highway. 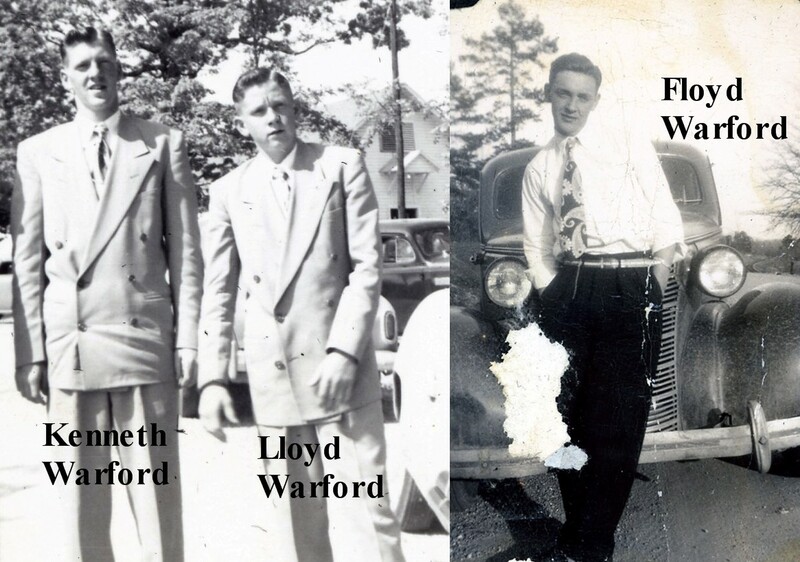 The Warford Band was made up of Floyd Warford on guitar and vocals, Kenneth Warford on guitar and vocals, Lloyd Roland Warford on the fiddle and Nina May Elliot on the piano. At times Otis Elliot, Chuck Warford and Homer Graves also played and sang with the Band. The Warford Band like most bands only lasted a short time. The band broke up when Lloyd Roland Warford and Kenneth Warford went to college. This audio recording last about 20 minutes and I promise the longer you listen the clearer it will sound. I don’t have any pictures of the Warford Band playing but I have posted a few pictures of some of the members taken when they were young. If anyone has any pictures of the band or the members playing music please share. All of my Warford digital files are available to any family member, just ask. I would also be interested in posting pictures of KBBA station in the early days or even pictures of the sponsors, L.C. Parsons and Elmer Lewis and Parsons or Lewis Grocery and Service Station if anyone has pictures they are willing to share. Please enjoy the Warford Band brought to you by KBBA of Benton Arkansas.